Win on Saturday, and Connacht will achieve their seasonal ambition to qualify for next season's Champions Cup. That is the huge carrot for Pat Lam's men when they host Munster in this vital Guinness Pro 12 fixture in the Galway Sportsground (7.15pm ). And Lam says his squad is an a "great space" to do just that. "I made it clear to players that all the hard work has put us in a pretty clear situation. Three games, and mathematically if we win one without a bonus point, we are guaranteed top six, done and dusted, which is our main goal from the start of the season. If we win two out of the three, we are guaranteed a semi-final, and if we win three out of three, we are guaranteed a home semi-final. It is a wonderful position at this stage of the season." Connacht know Munster travel to Galway needing a win, not only to consolidate their top six place, but to make the play-offs. And, having lost to Connacht in Thomond Park for the first time in 29 years, Munster will approach this fixture as another cup final. "Munster have quality players - more internationals than we do. We’ve got a lot of respect for what Munster do. We know that if we just go out there and try to muscle up, and get caught up in the occasion – because it’s going to be the biggest crowd ever and the atmosphere – then we’ll come off second best. Like all the other games we’ve played, everyone’s season is on the line. It’s great. Everyone is fighting to get into the top six. 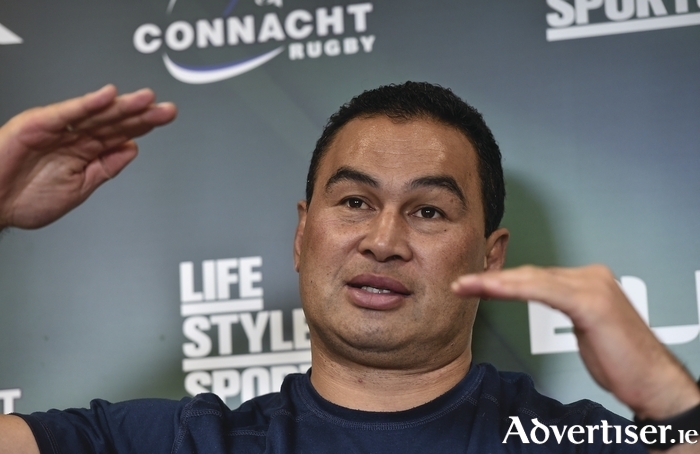 They are a desperate team too, but they’ve got enough quality that will cause a lot of trouble if we don’t deal with it well" continued the Connacht coach. Lam has been forced to add wing Danie Poolman to the injury list after he damaged his foot in the 33-32 defeat in France, but good news is that outhalf Jack Carty has been cleared fit and available after 10 weeks sidelined following surgery to remove his spleen. "We are conscious he [Carty] hasn’t played for a while, and I am conscious that I have named the starting team three weeks in a row, and that starting team hasn’t got to the start line" said Lam. Eoin McKeon, a late withdrawal last week due to illness, is expected back, while prop Nathan White continues to be monitored following concussion in Connacht's win over Leinster. AJ MacGinty and fullback Tiernan O'Halloran are continuing rehab with hopes of being available "in the coming weeks", but Jake Heenan is ruled out for three to four weeks with an ankle sprain. With so much at stake for all sides heading into the final three fixtures, Lam says it is all up for grabs. "Anyone can beat anyone on the day, everyone has motivation, but if we get caught up in what other people are trying to do, or outcomes, and so forth, then we will be in trouble, so our whole focus is on how do we beat Munster, what are our learnings from the last game, and let's go about doing that, and don't get too caught up in all the external distractions. We have to remember we are playing two finalists from last year, albeit at home, and then Treivso who are desperate to get in ahead of Zebre, so there are no easy games. "We must ask questions of Munster's defence and of their attack. That is the way we have played all year. If you have the most experienced team to do that, fantastic, but the reality is the team changes, and I have academy boys out there who are doing a great job, but they are learning on the run. There is no doubt if everyone was available then a lot of those guys would be playing in the AIL this week, but they are playing at the top level. Making sure individual execution and individuals get their roles right is the success of this team. That’s where it’s got us this far" he concluded.